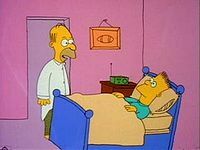 Audiences were introduced to The Simpsons for the first time, in the form of interstitial shorts on The Tracey Ullman Show, on April 19, 1987. The Simpsons was created by Portland-raised cartoonist Matt Groening (Ainsworth Elementary School and Lincoln High School). Homer and Marge say goodnight to their kids but all does not go according to plan. Bart philosophically contemplates the wonders of the mind, Lisa hears Marge say “Don’t let the bed bugs bite” and fears that bed bugs will eat her, and Maggie is traumatized by the lyrics of “Rock-a-bye Baby”. Ultimately, all of the kids decide to sleep with their parents.